High-order hexes, quads, tetrahedra and triangles are supported up to arbitrary order. Prisms supported up to order 4, pyramids up to order 1.
will generate an order 7 Gmsh mesh. In the rest of these subsections, we discuss the various processing modules available within NekMesh. Often one wants to visualise surfaces of a 3D mesh, or extract the values of variables on the surface and visualise them. To support this, NekMesh can extract two-dimensional surfaces which can be visualised using FieldConvert in order to extract the value of a 3D field on a given surface. which will produce new composites for the extracted boundary. This option will remove all high order curvature on all element types with singular jacobians. attempts to remove curvature from elements only where necessary. This is a simple algorithm that removes curvature from invalid elements and repeats until all elements are valid. Either all or invalid must be specified. all: remove curvature from all elements. invalid: remove curvature from invalid elements. prismonly: consider only prisms when removing curvature. This is useful in the presence of a prismatic boundary layer. This module should be added to the module chain if the user suspects there may be a mesh issue. The module will print a warning if there is a connectivity error. length which determines how long the z extrusion will be and layers, the number of elements in the z direction. 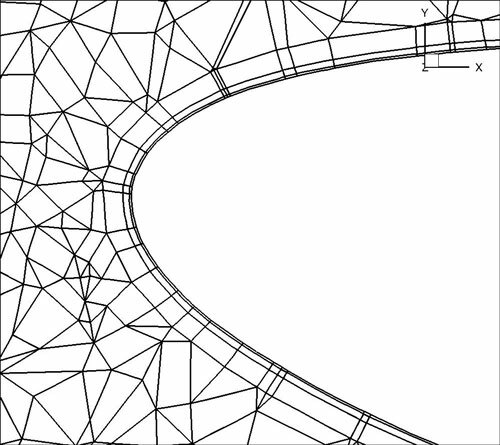 This module can correct invalid and improve the quality of elements in high-order meshes by applying curvilinear deformation to the interiors of domains. It achieves this by solving a solid mechanics system which, using variational calculus has been cast is a non-linear energy optimsation problem. It is basis of the work in . It works by considering the boundary (curved) mesh entities to be fixed and moving the interior nodes to a lower energy configuration. 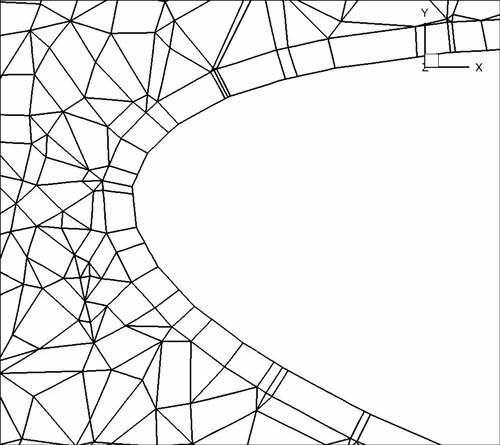 This new configuration in most scenarios is a higher quality mesh. The energy is evaluated depending on which functional is chosen. We find hyperleastic to be the most reliable but it can also model the mesh and a linearelastic solid as well as functionals based on the Winslow equation and the distortion method proposed by Roca et al. .
where type can be hyperelastic, linearelastic, winslow or roca.